Back in October, I declared Bone Tomahawk the most brutal movie of the year. I may have to take that back. As someone who has yet to really embrace anything I've seen from Mexican filmmaker Alejandro González Iñárritu, I had my doubts about The Revenant. I have found his movies to be skillfully made but bloated and pretentious, collapsing under the weight of their own sense of self-importance. His latest effort is certainly guilty of these things as well, but it's to a lesser extent and all but neutralized by everything that is beautiful and haunting about the film. 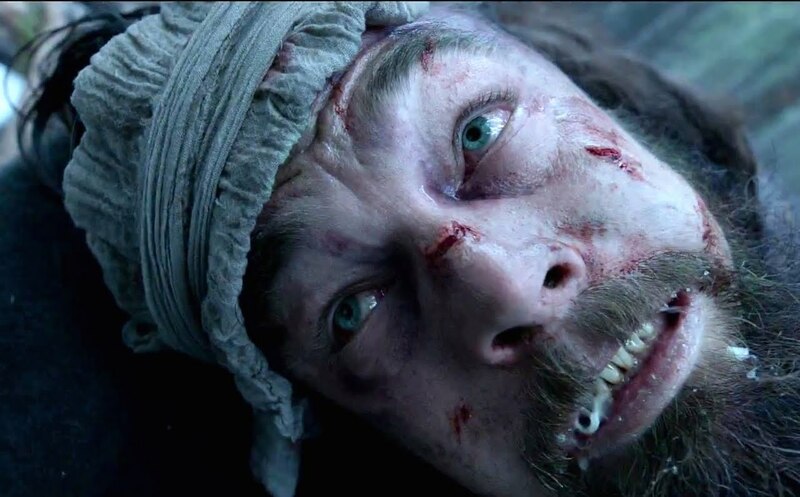 And The Revenant is both haunting and beautiful. This is a savage tale of survival and revenge set against the American frontier. It is an incredible piece of filmmaking. 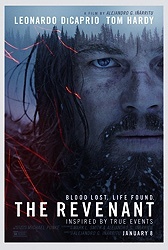 Based on the 2002 historical novel by Michael Punke, The Revenant casts Leonardo DiCaprio as Hugh Glass, an explorer and part of a fur trapping expedition in early 1800s America. He and his Native American son are among the survivors of an insanely brutal attack that opens the film, a group that also includes Captain Henry (Domhnall Gleeson), opportunistic Fitzgerald (a mumbling Tom Hardy) and frightened Bridger (Will Poulter). After Glass is mauled by a bear, he is left for dead but survives, swearing revenge on the men who left him behind and robbed him of everything that matters. Many stories have already been written about what an intense and difficult (and at times dangerous) shoot it was making The Revenant. All of that is up on the screen. From the opening raid -- one of the best constructed action set pieces of the year, though it's much more about horror than it is visceral thrills (it is the Saving Private Ryan D-Day sequence for the American frontier) -- to the prolonged bear attack to falls down mountains to sleeping inside of dead animal carcasses, there's hardly a moment of the movie not covered in dirt and snow and blood and pain and misery. This is a story forged of suffering, suggesting that America was built on the backs of men who died and those who survived long enough to drag themselves through the dirt and stand back up. After a breathless first hour or so, the film starts to spin its wheels in hour two as Glass is put through the paces again and again. It's during these passages that Iñárritu gives in to some of his lesser instincts before resolving the story in a manner for more conventional than aggressive, eccentric technique would suggest. It's disappointing to see a movie that begins as a rumination on the totality of the early American experience and ends the way any generic action movie does. I've seen this kind of inverted structure work well before -- a movie that starts big and gets smaller and more focused instead of opening up as it goes -- but here it just feels like Iñárritu is to preoccupied with the specificity of the narrative and loses sight of the brilliance of its first hour. The movie running through my head as The Revenant unfolded was Francis Ford Coppola's Vietnam epic Apocalypse Now. That's not to say that the former achieves the latter's scope or grandeur or that it will share its legacy, just that, like Coppola, Iñárritu made a film (2015 Best Picture Oscar winner Birdman) that was extremely positively received both critically and commercially and used that currency to make a movie that is lunatic in its daring and danger. 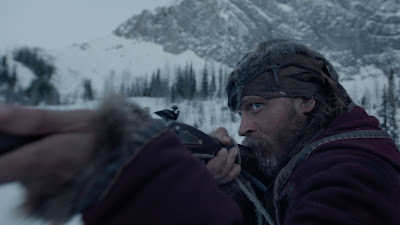 There are countless moments in The Revenant that feel positively irresponsible, but they have resulted in some of the most breathtaking sequences in a movie this year. Iñárritu's filmmaking is as poetic as ever, but where The Revenant achieves its greatness is not in its poetry but in its depiction of the harsh realities of early American life. The movie shows us things we've never seen before in a way we've never seen them. Goddammit it's something. It's impossible to credit Iñárritu with everything that's good about the movie; almost as much credit belongs to the cinematography by Emmanuel Lubezki, who shot Birdman for Iñárritu as well as Gravity and Children of Men for Alfonso Cuaron and the last four Terrence Malick films. His work here is not only impossibly beautiful -- photographed in all natural light primarily in the wilderness of British Columbia -- but also innovative. There are shots here that seem as though they shouldn't exist, achieved through a mix of practical creativity and digital trickery. Iñárritu once again demonstrates his love for the long take, but here it lacks the self-satisfied showiness of Birdman. Instead, it has the effect of totally immersing us in the miserable conditions and dangerous landscape. Where once his technique pushed us outside the film by trying to impress us, now we are lost within it. 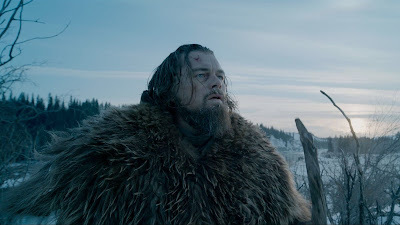 I was shaken by The Revenant immediately after seeing it. I knew I had seen great filmmaking, but I also knew that there's an hour in the middle of the movie that felt slow and repetitive and that where the film lands seems too simplistic in comparison to where it begins. Twenty four hours later, I'm still thinking about the movie, its images burned into my brain. The way Iñárritu tells the story is far more compelling than the story he's telling, but he's also pushing the possibilities of cinema in new directions. No one else should follow his lead -- he's lucky no one died making the movie -- but just this once he has achieved something beautiful and daring and raw and impossible. No one is more surprised than me. Great review. It's good to hear the movie is less self indulgent than Birdman, though I think its self indulgent approach is somewhat fitting given what the film is about. Here's hoping Leo finally gets his after this movie. Really been looking forward to this movie as some of it was made in my home town (Calgary, AB) - I was not a fan of Birdman but really thought this subject matter would work better with AGI's style. The trailer was so jarring and fascinating i've been anticipating it more and more everytime I think about it. Glad to hear Patrick enjoyed it! I look forward to hearing what everyone else on the site has to say about it (maybe on the top ten show). Great review Patrick! I'm really struck by your comment "the way Iñárritu tells the story is far more compelling than the story he's telling..." I agree. I think that's always where things get interesting. So many of our stories are the same, but that doesn't need to be an insult to the source material or a commentary on the dullness of the human imagination. For a director who's trying to "achieve" something (and as douchy and pretentious as that sounds, wouldn't we all rather a director be trying to say something beyond 'cash my check'? )—and Iñárritu certainly seems to be trying to achieve something with The Revenant—that familiarity of story becomes a blank canvas. We can see those old stories with fresh eyes. It may not always work, or work all the way, but I get so frickin' sick of leaving a theater saying "meh" that I give a director huge points for trying to do more. For me, The Revenant really worked; it gave me a lot to think about and, in the end, I found it life-affirming. I do think it gets a little self-indulgent and that the ending is disappointingly pat (and I'm wondering how much of that is actually part of Iñárritu's point) but for me, "what works" outweighs "what doesn't" by a wide margin. And in the end, one things I find life-affirming about The Revenant is what you point out in your final line: that a bunch of people with something in their hearts somehow—miraculously and dangerously and impossibly—made it happen at all. Great review Patrick. Doesn't come out for a couple weeks here yet but I'm really pumped for it. I didn't totally buy into the whole Birdman aesthetic either but I feel like Innaritu's showiness could be well served here with the whole American landscape to play with. Plus it's always exciting to see Leo keep pushing for that elusive Academy Award...why do I care? Maybe because he really seems to. Just a heads up, this hasn't been updated in the "movies A-Z" section. A tough, uncompromising, very good but also a bit overlong film - a perfect start into the new movie year. Technically and visually outstanding with some incredible scenes where you'd rather not know the circumstances under which they were made. Filming this must have been a nightmare. I’m sure the opening sequence and the fight with the bear won´t be surpassed by anything in the foreseeable future. Great acting by a very fine cast that includes, in addition to DiCaprio and Hardy, interesting character actors like Paul Anderson, Will Poulter and Lukas Haas. And does someone had a better year than Domhnall Gleeson with this, Ex Machina, Brooklyn and Star Wars just in 2015? I could have done very well without the tedious frequent shots of waving treetops, as well as some dream sequences that looked too much like the artistic narcissism of Terrence Malick. That being said, the movie was a real treat to watch on the big screen. I hope it will do well at the boxoffice but I´m very curious how this will work with the general zero attention span audience, especially regarding it´s high reported budget of 135 millions. The movie that impacted me the most by this director is still Biutiful. Disclaimer, I watched it while while riding on a greyhound bus, on Christmas Eve, on my way home after not seeing my kids for 2 months (gone for work, and had been virtually alone the whole time as I didn't speak French). Car had broken down, and so made the last leg by bus to not miss Christmas. Point being, in a weird emotional state. I sobbed and sobbed like crazy at the end of that movie. The lady seated beside me was quite concerned. I've never revisited it, so can't say whether it was me, or whether the movie was as powerful as I remember. Hmmmmmm.